The dignitaries, who will receive honorary doctorates, were recognised for the contributions to their fields at a graduation ceremony in November. Team GB sailors Hannah Mills MBE and Saskia Clark MBE (top), who won gold in the 470 race at the 2016 Rio Games, both received an Honorary Doctorate of Science. They were joined by Nick Dempsey (above), the most decorated men’s Olympic windsurfer, who won a silver medal at last year’s competition in Brazil. He also received an Honorary Doctorate of Science. Paracanoe champion Emma Wiggs MBE (above), a University graduate and gold medal-winner in Rio, was awarded an Honorary Doctorate of Education. Also included was former Vice-Chancellor Clive Behagg (below) who, across 41 years at Chichester, oversaw signification expansion of the University and received an Honorary Doctorate. Award-winning playwright Tanika Gupta, whose productions focus on multicultural inclusion and social justice, and has written for Eastenders and Grange Hill, will collect an Honorary Doctor of Theatre. The group joined more than 2,000 graduates at the Chichester Festival Theatre on Sunday 5 and Monday 6 November. Also accepting an Honorary Doctorate of Art was contemporary dancer Liz Aggiss (above). She shared the stage with Ruth Valerio (below), a director of an international charity dedicated to alleviating worldwide poverty and disease, who became an Honorary Doctor of Divinity. The figures also included chartered electrical engineer Benita Mehra (below), a champion of female and BAME scientists, who received an Honorary Doctorate of Science. She is President and Trustee of the Women’s Engineering Society and a Fellow of the Institute of Engineering and Technology. Greg Valerio MBE (below), collecting an Honorary Doctorate of Business Administration, works with the Fairtrade Labelling Organisation to coordinate its international gold programme, which supports workers facing exploitation in the world’s most dangerous mines. 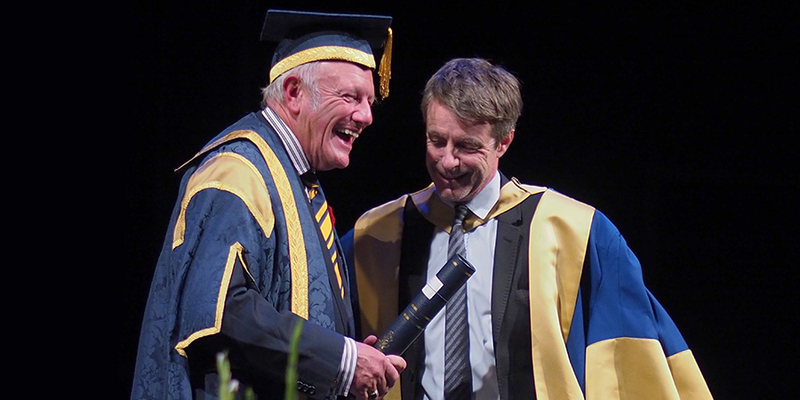 Finally composer Harry Gregson-Williams (below), who has scored the soundtracks to Hollywood blockbusters and videogames from the Call of Duty franchise, became and Honorary Doctor of Music. Vice-Chancellor Professor Jane Longmore said: “Graduation is rightly seen as a celebration of achievement and the triumphant end of an important phase in our students’ life. A degree is much more than just a measure of educational attainment, it is a test of character, of resilience, of determination and creativity." To find out more visit www.chi.ac.uk/graduation or email graduation@chi.ac.uk.